Densely covered by river network, Foshan is a famous city with long history and rich culture. It has many tourist attractions and the infrastructure is complete and convenient. More than 67 hectares of peach blossoms are fully blooming in Nanguo Peach Garden. Xiqiao Mountain is one of the four famous mountains of Guangdong, with wonderful natural landscape, rich tourism culture details as well as simple and natural folk customs. Zhongshan Park, located at the waterfront of Fenjiang River, northeast of Chancheng District, is a complex park integrating leisure, entertainment, propagation, exhibition, scientific promulgation and dining. Foshan Folk Art Research Institute was set up by the government in 1956. It is a special institution for researching, inheriting and developing Foshan traditional folk art. As for the old residents in Xiaotang, these pictures record the heyday of Xiaotang train station. Inspired by Hengdian World Studios, Xiqiao mountain Guo Yi World Studios is the world's first comprehensive project which movie and TV, tourism, leisure and religion are planned in one place. Hai Shou Island, located in the XiJiang River between JiuJiang and HeShan, deserves the name of xanadu. The public can go to Forest Park of Shunfeng Mountain to watch the exhibition. 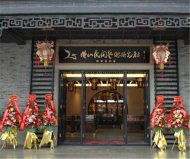 Visiting the Ancestral Temple on the fifth day of the Chinese Lunar Year marks the inheritance of tradition. A new waterfront park is about to be built around the dock of Foshan New Port. The 8th Lishui Lily Culture Festival in Nanhai opens free from January 17 to 24. Recently, a field of pinkness is blooming in Jun’an, Shunde, covering an area of 6,000 square meters. The “Marvel Summer Superhero Exhibition @ Lingnan Tiandi” has landed in Foshan from July 8 to Sep. 3. There are lots of activities to be held in this May in Foshan. Let’s see if there is something interests you. The youth arts fair “Here! Here! Month of Lingnan Arts” in Lingnan Tiandi was open since April 8.